NEW YORK, NY--(Marketwire - May 20, 2008) - "Harry Potter and the Sorcerer's Stone," the first book in J.K. Rowling's phenomenally best-selling series, will be released in a special anniversary edition on September 23, 2008. The book, published by Scholastic, will feature exclusive bonus material from J.K. Rowling as well as new cover art and a four-color frontispiece by Mary GrandPré. 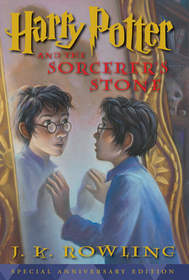 The special anniversary cover of "Harry Potter and the Sorcerer's Stone" (Scholastic/Arthur A. Levine; $30.00) depicts 11-year-old Harry looking into the Mirror of Erised, which Harry comes across in his first year at Hogwarts School of Witchcraft and Wizardry, and learns that the mirror shows you what you most desire. "It's a real treat for me to get another chance to visually bring Harry back to his fans in not only a new scene, but in a new light," said American illustrator of the Harry Potter books, Mary GrandPré. "Going back to draw the first cover for the anniversary edition was an opportunity for me to show another side of Harry... a vulnerable side. Having come to know and love Harry the way we all have, after experiencing the whole series, I think we can appreciate him even more on an emotional level." Published in the United States in September 1998, "Harry Potter and the Sorcerer's Stone" was praised by The New York Times as, "... as funny, moving and impressive as the story behind the writing. [J.K. Rowling] had wizardry inside, and has soared beyond her modest muggle surroundings to achieve something quite special." There are currently 28 million copies of "Harry Potter and the Sorcerer's Stone" in print in the U.S. alone, and 375million copies of the seven books in the Harry Potter series have sold worldwide in 65 languages. For more information about Harry Potter visit www.scholastic.com/harrypotter.